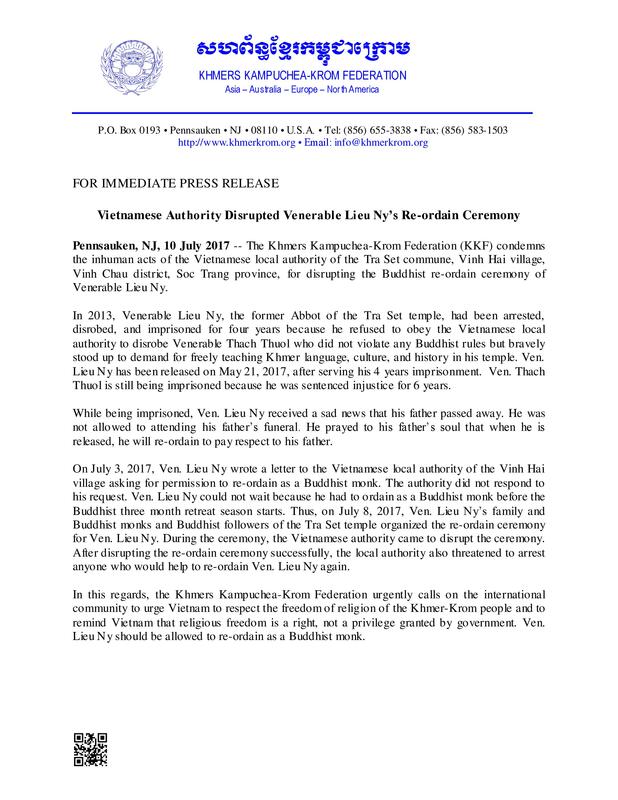 Pennsauken, NJ, 10 July 2017 — The Khmers Kampuchea-Krom Federation (KKF) condemns the inhuman acts of the Vietnamese local authority of the Tra Set commune, Vinh Hai village, Vinh Chau district, Soc Trang province, for disrupting the Buddhist re-ordain ceremony of Venerable Lieu Ny. In 2013, Venerable Lieu Ny, the former Abbot of the Tra Set temple, had been arrested, disrobed, and imprisoned for four years because he refused to obey the Vietnamese local authority to disrobe Venerable Thach Thuol who did not violate any Buddhist rules but bravely stood up to demand for freely teaching Khmer language, culture, and history in his temple. Ven. Lieu Ny has been released on May 21, 2017, after serving his 4 years imprisonment. Ven. Thach Thuol is still being imprisoned because he was sentenced injustice for 6 years. While being imprisoned, Ven. Lieu Ny received a sad news that his father passed away. He was not allowed to attending his father’s funeral. He prayed to his father’s soul that when he is released, he will re-ordain to pay respect to his father. On July 3, 2017, Ven. Lieu Ny wrote a letter to the Vietnamese local authority of the Vinh Hai village asking for permission to re-ordain as a Buddhist monk. The authority did not respond to his request. Ven. Lieu Ny could not wait because he had to ordain as a Buddhist monk before the Buddhist three month retreat season starts. Thus, on July 8, 2017, Ven. Lieu Ny’s family and Buddhist monks and Buddhist followers of the Tra Set temple organized the re-ordain ceremony for Ven. Lieu Ny. During the ceremony, the Vietnamese authority came to disrupt the ceremony. After disrupting the re-ordain ceremony successfully, the local authority also threatened to arrest anyone who would help to re-ordain Ven. Lieu Ny again. In this regards, the Khmers Kampuchea-Krom Federation urgently calls on the international community to urge Vietnam to respect the freedom of religion of the Khmer-Krom people and to remind Vietnam that religious freedom is a right, not a privilege granted by government. Ven. Lieu Ny should be allowed to re-ordain as a Buddhist monk.